In a broad sense, galaxies can be grouped into three types: spirals, ellipticals and irregulars. Of these, ellipticals and spirals are by far the most common. Most of the galaxies we see around us are spiral galaxies, but throughout the universe ellipticals are more common, making up about 60% of all galaxies. The categorization of galaxies was first made by Edwin Hubble in 1926, and became known as Hubble’s tuning fork. It was so-named because the variety of galaxies could be laid out along a scale of ellipticals which then branched into two types of spirals. When Hubble proposed this scheme, some suggested that it indicated the nature of galactic evolution, where round, elliptical galaxies gradually changed into flat, spiral galaxies. Hubble himself was cautious not to assume too much about the classification scheme. Still, it does raise an interesting question about these types of galaxies. Why do some become spirals and others not? 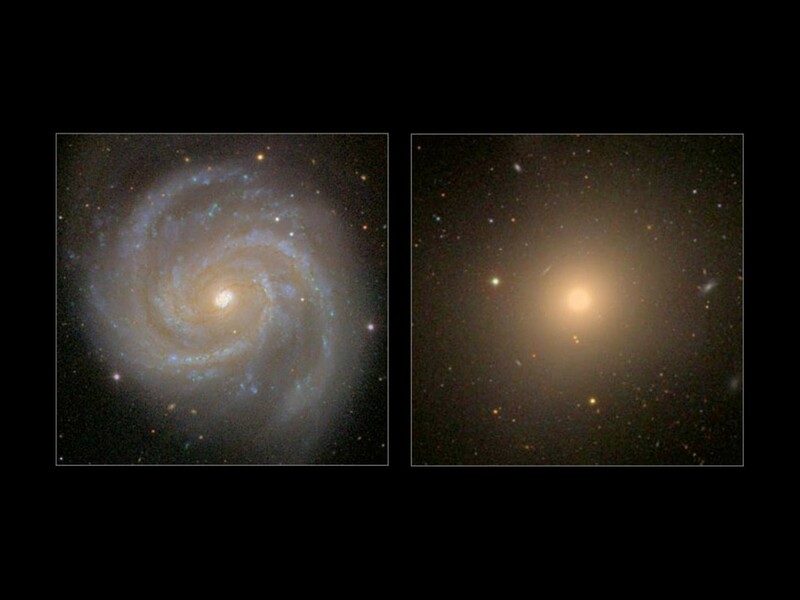 When we look at elliptical and spiral galaxies, we notice some pretty clear differences (beyond their apparent shapes). Spiral galaxies tend to be brighter, with lots of young blue stars. Spirals also have lots of gas and dust available to make new stars. It’s this propensity of dust in our own Milky Way that creates things like the zone of avoidance so bothersome to astronomers. Ellipticals, on the other hand, contain mostly old, red stars. They also tend to be largely devoid of the gas and dust necessary for star production. This would seem to imply an evolution of galaxies moving from spiral to elliptical. In this model a young galaxy develops a spiral structure through density waves in the galactic cloud, which encourages the production of stars. The largest and brightest stars live short lives ending in supernovae, which feeds the production of new stars for a while. But eventually the available gas and dust is consumed by star production, and only the small red stars (which will continue to shine for a trillion years or more) remain. While this seems a reasonable model, it turns out to be a bit too simplistic. When we look at the metallicity of stars (that is, the amount of elements other than hydrogen and helium they contain) we find that stars in elliptical galaxies can have metallicities three times higher than that of spiral galaxies. Metallicity is a rough indicator of the age of a star, since the first generation of stars would be almost entirely hydrogen and helium, while subsequent generations formed from the remnants of earlier stars have increasingly higher metallicity. If the difference between elliptical and spiral galaxies were simply that ellipticals are older, they must have formed earlier in the universe, and thus their red stars should have lower metallicity, not higher. Another clue come from the fact of where we find different types of galaxies. Elliptical galaxies tend to be seen in large superclusters of galaxies, and in dense galaxy clusters. Spirals tend to be found in less clustered regions, and rarely exist in dense clusters. In the early universe, the first clusters of galaxies would tend to form larger and tighter clumps due to gravity and dark matter. More dense clusters would tend to have more galactic collisions early on. So the current model is that ellipticals did begin as small spiral galaxies, in early galactic clusters, but frequent collisions stirred them up, causing them to enter a time of rapid star production known as a dusty starburst period. This caused them to consume their gas and dust early on. Subsequent collisions disrupted any remaining spiral structure, and without gas and dust the density wave effect seen in modern spirals couldn’t occur. The dusty starburst period would explain why ellipticals have high metallicity, and this model also explains why we see them in the large superclusters that formed in the early period of the universe. The spiral galaxies we see today could be younger galaxies, but they could also be older galaxies that weren’t supercharged by early collisions. Their star production could thus occur at a more sedate pace. As we observe galaxies at increasing redshifts (and thus farther back into the history of the universe) we see things such as small spirals in early clusters, so the model seems to work well. So it seems that Hubble’s quest to understand galaxy evolution was on the right track, it was just the opposite of what his tuning fork implied.